FTL had the distinction of being one of the first companies to release a game that really took advantage of the ST's graphics capabilities. 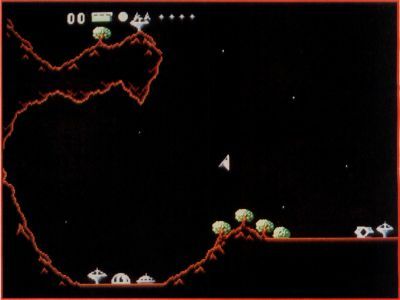 That program, Sundog, was a smash hit, not only because it had very little competition in the ST game market, but because it was a unique and playable game. Recently FTL released Dungeon Master and immediately added to its reputation by being the proud publisher of what turned out to be the best- selling piece of ST software of all time. Now on the shirttails of those two sensational products comes something a little different, Oids. Does this game live up to the reputation that FTL has created for itself? That's a tough question to answer because Oids is a very different type of game from Sundog and Dungeon Master, both of which are basically graphic-oriented adventure games. Oids is a kind of Lunar Lander/Choplifter combination (new ideas on old themes, remember? ), which, if you wanted to stretch the term, could probably be placed in the adventure genre, though, I think it falls more easily into the arcade category. Oids is a very different type of game from Sundog and Dungeon Master, both of which are basically graphic-oriented adventure games. Oids is a kind of Lunar Lander/Choplifter combination. The graphics aren't anywhere as near stunning as those of Dungeon Master, though they are adequate and perfectly suited to the game. The sound effects are reasonably good, though, not outstanding. Is Oids a step backward for FTL? Yes and no. Placed next to Dungeon Master, Oids just doesn't have the pizzazz to stand up; however, that is not due to any lack in Oids, but rather due to the fact that Dungeon Master is so sensational. Considered away from the Dungeon Master prejudice, Oids is a fine and worthwhile game that any game company would be proud to have in its catalog. Ah, but what about the game? Basically, you have to pilot a spacecraft through a variety of alien landscapes in an effort to release the "Oids" from their slave labor in the factories and bring them to the mother ship which will take them home All manners of alien weaponry and craft do their best to impede your progress. On the higher levels, you're in a constant battle for your life, while at the same time you must attempt to rescue the Oids. The ship may be controlled by a joystick or the keyboard (I prefer the joystick). Just as with the lunar-lander-type programs I mentioned, you have to continually give the ship enough thrust to keep it from crashing on the planet's surface and to keep it going in the direction you want. To slow your ship requires the use of "reverse thrust," turning the ship so that the engines face the direction of travel and applying thrust to slow the ship. As for weaponry, your ship is armed with "nuclear pellets" and "nova bombs," the former being released in a machine-gun fashion, while the latter is dropped one at a time to the planet's surface and detonated. You are also given a shield which may be used to help you get out of tough scrapes. Nothing can harm the ship while the shield is activated, but an activated shield is a continual drain on energy. When your energy gets low, you have to land and refuel—which could be a problem if you're not near a "Biocrete fuel base." There are plenty of surprises in Oids. Things pop up from underground to fire on you, and alien ships suddenly appear from any direction. Ground weaponry can be found almost anywhere— sometimes even hanging upside down at the top of the screen. And, like Blockbuster, Oids comes with a construction set that allows you to create your own levels. There are many new screens, created by other Oids players, available for downloading on such telecommunications services as DELPHI. In fact, FTL awards $100 to the best Oids galaxy that gets submitted to their monthly contest. The contest runs until March 31, 1989, so you've still got plenty of time to get in on it. The first time I sat down to play Oids, I started at about 11 pm. When I finally decided it was time to put the disk away, the sun was coming up. Need I say more?